Although this comforter was originally bought for my niece, I liked it so much I kept it for myself and got her something else. I loved the color and material but it was so silky that it keeps sliding off the bed as I sleep. However, I would still recommend to friends. Enhance your existing bedroom decor with this stylish comforter which is available in a variety of colors. Crafted from ultra soft microfiber, this comforter features an elegant dobby stripe pattern. Constructed with box stitching, this comforter is stuffed full of warm and cozy polyester down alternative fill. I purchased these comforters for business, which requires washing them on a weekly basis. Originally they looked really great but after 2 months of use and weekly washed they started to lose shape and got fully covered in lint balls. I think soon i will have to cover them with duvet covers... This is an update. We've been using these comforters for a year now, and as I expectd and stated in the original review, I am a bit disappointed in these comforters. They do not withstand frequens washes. After a year of weekly washes they are fully covered in lint and lost shape. Although they looked really pretty in the beginning, now I have to use duvet covers on them. For the household use they maybe ok, but next time i am shopping for comforters, I will go with ones with cotton outer. Good coloring. Snuggle and cozy. My cats love it of course. 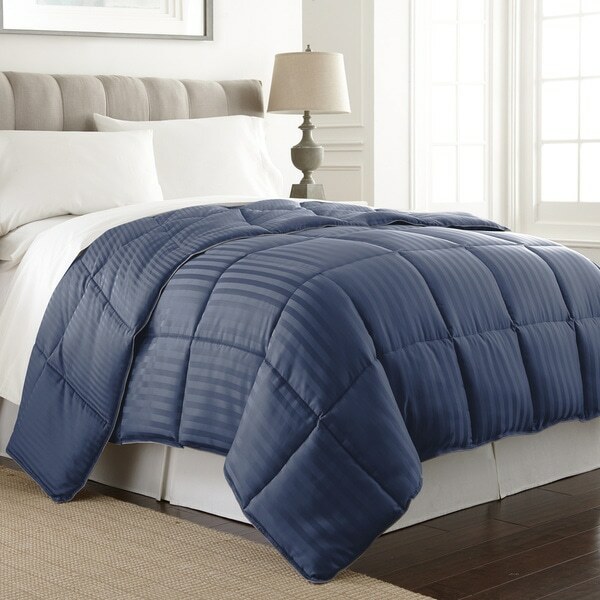 I love this comforter it's light weight warm and comfortable and looks great. I would recommend it if you like a warm soft bed. I liked the color of this comforter and it is very warm; however, the fabric left much to be desired. It snagged on everything, which made it very uncomfortable to use. I finally put it in a duvet and am using it that way. Love this comforter. I have a high bed so I bought a size larger to cover both sides of the bed. Have not had any issues with it and it's nice and soft for sleeping. Nice enough comforter, but it has not held up well to being washed...lots of pilling and the color is fading. I love this , warm yet light weight, beautiful fabric. Great price! Slightly larger than other full queen which fit into my cover better. How can you argue with this price? I bought this for my son who lives in Colorado. He says it is really nice and warm as well. I think the dog likes it too! "Why don' you enter sizes other than twin full queen king or cal king oversized king You should give more of a description. Inches, feet. ..... true size. Not size"
"Is the chocolate comforter really caramel in color instead of brown? The picture shows caramel color." The pictures are accurate, taken in studio light. "Looking for a comforter that has some weight to it like a goose down comforter does, but is not goose down. How would you describe the WEIGHT of this comforter?" It does have weight to it and feels comfy. It's a nice comforter and looks more expensive than it is. "What is the texture and "feel" of the comforter? Is it velvet-like/sateen/silky? Thanks." This is silky. I hope this helps. "does this get too wrinkly?" No,this does not get wrinkly.